Everything came in a nice big cardboard box — which they opened at the store (you know, destroying any protective integrity that the boxes once had) then taped them back up haphazardly and helped us load them into my wife’s truck. We drove to the far end of the parking lot, took everything out of the back, and then re-arranged things in a MUCH safer way for the car ride home. After an uneventful car ride home, entirely due to our stellar packing job, it was time to bring stuff into the house. We started with the dresser — the heaviest and most awkward of the pieces — and slowly made our way in the front door. The second box, a big wide flat one, contained the crib. Just from looking at the box, this was going to be an IKEA-style project. Luckily, since it wasn’t nearly as bulky, it was easy to get into the house and up the stairs. The dresser, however, was a beast. We took all of the drawers out to lessen the weight, but it was still pretty heavy. Weight wasn’t the main issue though. The dimensions of the stairwell were the problem. Low clearance, walls on both sides all the way up, and a 90 degree turn thrown in for an added challenge. Our first two attempts were unsuccessful. Both attempts ended with the dresser tightly wedged at the turn in the stairs. We tried one more time and it barely, with less than a half inch to spare, cleared the corner and the lowest part of the ceiling. Now, at this point, I’m all sweaty and out of breath. It’s also beginning to get late and we’ve got to go to work in the morning. Of course not. The project is not complete. We start putting together the crib and it’s just like an IKEA piece of furniture — something we’re very experienced with. Of course I don’t ever remember paying so much for something that I had to assemble with an Allen wrench, but still, it looks like a pretty nice and solid piece of furniture. By 9:30 pm, we’re done and I’m settling in to watch 30 Rock, part of my normal Thursday night routine, before hitting the sack. All-in-all, the room looks pretty nice and I’m pretty happy with our selection and not at all worried about how much we spent on it all. Grant, who just had a baby of his own (congrats!) and often leaves great comments here that get me thinkin’, mentioned after the we purchased the furniture that we should just accept the fact that we’re going to buy a bunch of stuff and to get all of the big purchases made now. We’ll see what happens when the statement arrives! 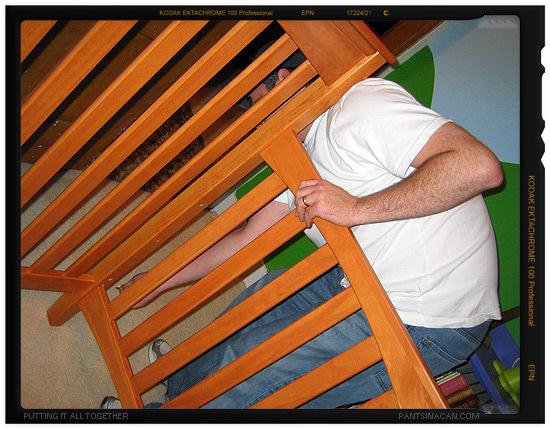 A sweaty man assembling baby furniture. Pretty hot, Brainy!